ജാടതെണ്ടി.കോം : Obamarama a new "Barack America"
Obamarama a new "Barack America"
These are the words by Mr.Obama when he was elected as the president of USA. I remember it was one of those late night browsing hours i came across an article about a senator from chicago winning grammy award. Next day evening in Barnes & Nobles saw this book by him. Already sold millions of editions. Barack Obama did not ring a bell in my mind to be candid about it.I knew former US President Bill Clinton had won a grammy earlier. But never in my wildest imagination or logical permutations i would have believed obama to be an american president soon. 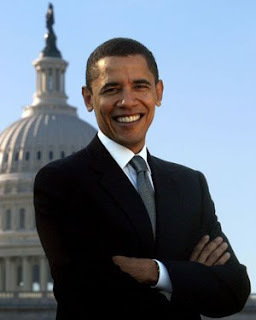 One day via TV i came to know about Barack Hussein Obama vying to stand for democratic nomination. Since then there has not been a day obama has not been on media. Either for the long feud with Hillary Rodham Clinton for Democratic nomination or for the presidential election campaign against John McCain. But all the way Obama had a charisma around him that made me read more and more about him ''on what he is? what he does? is he for real or how genuine is he?'' so many questions about an american president nominee was the first time in my mind. Maybe its more due to my awareness on world politics these days also the first US election am witnessing live. Obama is a seperate class altogether and some kinda persona alive in him makes millions of people believe him. A person with middle class background and only a good education to boast about has achieved what was impossible some years back. Though we dont say out aloud (like Lord VoldeMont in Harry Potter) 'black' was always a factor against obama. Full remarks to the republican counterparts even they ceased to mention the ill-word. But neither did he use it for his vote banks. May be this is what the other african-american community in the world need to learn from obama. You need to be 'unblack' yourself your mind and thoughts first.Andrew Symonds i hope u earn this trait soon. Another trait that i find refreshing is his approach to his personal life and the transparency in it. Doesn't mean he invites to the dinner table right away or takes you for a drink but many recognize him as a good father, a loveable grandson, a chap who likes to play basketball every week with his friends (His friends call him 'O'bomber for the shooting abilities check out the youtube video on his basketball skills). Also not to forget, he is unbelievably articulte not an ideal thespian for a politician but he talks in an attractive manner you would love to listen him whole day. Obama is no fluke or mug that just happened after bush's tyranny for 8 years. He was calculative, pin point decisive and he had strong policies to back his abilities. Though a first time senator but he made his debut counted by the reforms he brought about and the positive outlook on politics. A politician breed of different kind world has seen so far , he paves for a new generation of politicians with an 'audacity of hope' in them. Although his inexperience will be clearly exploited in coming days but given his amicable resume he is the one not to get bogged down. At this moment, How i wish politicians of my country campaigning for a 'change' rather than their 'caste'? But every country has its own way of functioning, but so did america. Until now the biggest day of democracy was when an old man with a stick walked 400kms also known as the salt satyagraha. LandSlide Victory of Obama stands somewhere close to it 'for me atleast'. In a democratic country this leaves you with nothing else but hope for a better dawn to descend upon us. Barack Obama you make 'common man' like us to think that extra boundaries we need to extend ourselves. Nothing is Impossible...Yes We Can! Yes We Can!!! !